Magical Uses and History: Mugwort is often considered a witch's best friend in dream magic. 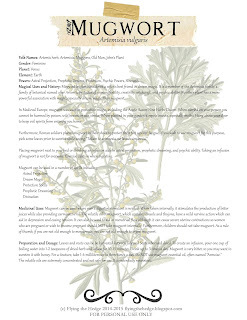 It is a member of the Artemisia family, a family of botanical named after Artemis, protector of women, fertility, creativity, witchcraft, and psychic ability. No other plant has a more powerful association with magic, especially dream magic, than mugwort. In Medieval Europe, mugwort was used in protection magic, including the Anglo-Saxon Nine Herbs Charm. When carried on your person you cannot be harmed by poison, wild beasts, or sun stroke. When planted in your garden it repels insects, especially moths. Hang above your door to keep evil spirits from entering you home. Furthermore, Roman soldiers placed mugwort in their shoes to protect their feet against fatigue. If you wish to use mugwort for this purpose, pick some leaves prior to sunrise while saying "Tollam te artemesia, ne lassus sim in via." Placing mugwort next to your bed or drinking an infusion aids in astral projection, prophetic dreaming, and psychic ability. Taking an infusion of mugwort is not for everyone. Exercise caution when ingesting. Medicinal Uses: Mugwort can be used where ever a digestive stimulant is needed. When taken internally, it stimulates the production of bitter juices while also providing carminative oil. The volatile oil in mugwort, which contains cineole and thujone, have a mild nervine action which can aid in depression and easing tension. It can also be used to aid in menstrual flow although it can cause severe uterine contractions so women who are pregnant or wish to become pregnant should NOT take mugwort internally. Furthermore, children should not take mugwort. As a rule of thumb, if you are not old enough to menstruate, you are not old enough to ingest mugwort. Preparation and Dosage: Leaves and roots can be be harvested between July and September and dried. To create an infusion, pour one cup of boiling water into 1-2 teaspoons of dried herb and infuse for 10-15 minutes. Drink up to 3 times a day. Mugwort is very bitter, so you may want to sweeten it with honey. For a tincture, take 1-4 milliliters up to three times a day. Do NOT use mugwort essential oil, often named "Armoise." The volatile oils are extremely concentrated and not safe for use. It is potentially neurotoxic. "Everything is Dual;...opposites are identical in nature, but different in degree." This is part of the fourth Hermetic Principle, the Principle of Polarity. It states that there are two sides of everything, but that opposites are really only two extremes of the same thing. Now you may be thinking, how can opposites be the same thing. Take hot and cold for example. Although opposites, they are the same thing, temperature, varying only in degrees. If you look at your thermometer you will see there is no specific place where hot and cold begins because there is nothing such as "absolute heat" and "absolute cold." Scientifically speaking, we tend to measure things based on when water freezes and boils, but these are not absolutes. Water is simply a measure by which we compare all other things. On the Kelvin cycle, there is such a thing as absolute zero, but again this is not necessarily where cold begins. Very simply put, hot and cold are both temperatures on a continuum. Light and dark is another such example; or the north and south poles of the Earth. The Chinese principle of Yin and Yang embodies this same idea. This principle ties directly into the third Hermetic principle, the Principle of Vibration. Each of these extremes varies by vibration only. To Hermetists, the most important aspect of the fourth principle is the ability to change the extreme or polar vibrations of the mind, such as hate and love. By mastering this principle you are able to change your own polarity, as well as that of others, through the use of will power and recognition of the duality of all things. Now there are some pretty obviously places duality shows up in the craft. If you believe in a diety, the dual nature of the God and Goddess is a great example. The Oak and Holly king are another. Moon vs Sun magic, banishing vs summoning spells, etc etc. Where does this principle show up in the craft for you? Hermetic Principle 3: "Nothing rests; Everything Moves"
The third Hermetic Principle is the Principle of Vibration. According to this principle "nothing rests; everything moves; everything vibrates." This principle has been proven time and time again by modern science, yet this principle was stated several thousands of years ago by Ancient Egyptians. This principle helps to explain the differences between the spirit, mind, energy, and matter. According to this principle, the highest form, spirit, vibrates so quickly and infinitely that it appears at rest, while the lowest forms of matter vibrate so slowly that they too seem at rest. What separates the spirit, mind, energy, and matter is the speed at which they vibrate, placing some forms above others on a continuum, not a pole. By mastering your own vibrations, particularly mental vibrations, you can control your thoughts and feelings and those of others. All matter, energy, and thoughts vibrate at some rate. We are taught in introductory science courses that atoms, which are the building blocks of molecules and hence all matter, are in constant motion. However, depending on how quickly they are moving, the form that they present themselves in may change. Think solid, liquid, and gas. Molecules in a solid form move slowly, while molecules in a gaseous form move very quickly. Liquid moves somewhere in the middle. However, not all liquids vibrate at the same rate just as solids and gases do not. Temperature, viscosity, gravity, and composition all affect the rate at which molecules vibrate. Even your own thoughts are vibrations of energy crossing across nureological pathways. By mastering this principle, you master one of the most basic science skills needed for not only understanding yourself, but the world around you as well. We see this in the craft by recognizing that all objects, living and nonliving, produce vibrations and energy. Being aware of these energies allows our magic to work. Are you in tune with the energies around you? The first principle of Hermetism is the Principle of Mentalism or "The All is Mind." This principle states that the All is unknowable and undefinable, but may be thought of as a living mind. Supposedly our universe and being is a mental creation of the All, and by understanding this, we can understand the varied mental and psychic phenomena that have no explanation or defy science. Furthermore, understanding this principle enables the individual to apply this idea to themselves in order to enhance well-being, open mental blocks and doors, and increase knowledge. While I don't believe in an All that created everything, I do believe this principle is applicable today. Witchcraft is a great example of using our minds to bring about change. As I mentioned in my post "What is Magic," magic is a manifestation of our mental energies. Practicing witchcraft and casting spells allows us to focus our minds on what we truly desire and manifest them into reality. No supernatural being does this for us; we do it for ourselves. Furthermore, yoga and meditation relies heavily on this principle. By relaxing the body and mind we are able to unlock mental blocks, leading to a healthier and happier being. This principle is based in scientific reasoning and while many of the mental and psychic phenomena used to be unexplainable, we are able to explain them today using science. Somethings are still misunderstood, but we are learning more everyday. It is no joke that the mind is a powerful tool. One of the best known cases of this is the placebo effect. Studies have shown time and time again that if a person believes something will "cure" them, it usually does or at least lessens the symptoms. We see this occur often in homeopathic remedies (not to be confused with actual holistic medicines based in real science), where users of these sugar pills insist they cured their ailments. It is obvious that placebo effect is real because this fraudulent market makes millions every year. Furthermore, if we change "All" to "We", this principle has true scientific basis. Everything we are is based in our minds. Your personality, behaviors, sleeping patterns, likes and dislikes, and all your muscle movements are a manifestation of your mind at work. With that being said, treat your mind well. Eat the appropriate amount of fat each day, read, solve puzzles, interact with others in positive and meaningful ways, relax, and get enough sleep every night. When your mind beings to go, the person you are goes with it. I hope this has been insightful. How do you define the first Hermetic principle? Since I have decided to turn the Seven Hermetic Principles into a series, idea courtesy of The Pagan Experience, I figured I would need to introduce what Hermeticism is and where it came from. Hermeticism is an ancient spiritual and philosophical tradition based upon the writings of Hermes Trismegistus. This tradition claims to have descended from prisca theologia, a doctrine which states that a single, true theology exists in all religions and this theology was given to man by God. Christians used Trismegistus's writings to support their claims that Christianity was the one, true faith. Hermeticism is made up of seven guiding principles. According to these, humanity is on a spiritual journey to unite with the Divine, but that we can't achieve spiritual growth without human effort. Furthermore, it encourages meditation, ritual, and other magical practices while seeking balance in all things. This may seem to fly in the face of an atheopagan practice, but upon further inspection I believe it fits quite snugly with it. Instead of viewing the single, true theology as a religious text, read it as science. All religions are an attempt to explain the world around us, and while unintended, science runs through all of them. Some of the science is bad, but it's science all the same. Our continual research and exploration of the world and universe around us brings us closer to them (the Divine by many other pagan standards). I will go into more detail of how Hermeticism supports atheist pagans when I cover the seven principles in detail. Until then, I hope this has given you something to think about. I AM NO LONGER UPDATING THIS LIST. I AM WORKING ON COMPILING A MASTER LIST AS WE SPEAK. IT SHOULD BE AVAILABLE IN 2019. TO SEE ALL OF MY BOOK REVIEWS, PLEASE CLICK HERE. Unlike many other spiritual paths, paganism and witchcraft, although not a religion, have no one book to guide us. This can make it increasingly difficult for new witches and pagans to get started. With all the information floating around out there, it can be overwhelming to newcomers. Where do you start? I always, always, always suggest books first. While the Internet is a great thing and blogs like mine are becoming an increasingly valuable resource, there is a lot of misinformation floating around. Yes, some books contain this same misinformation, but books are generally written by witches and pagans who have been practicing most of their lives. They are extremely well versed in their craft and have extensive tested knowledge and wisdom to share. Furthermore, they often contain very accurate correspondences, ritual guides, spells and outlines, and other pertinent information for beginner witches. In today's post, I would like to share my library with you. Mind you, my collection is small. I tend to buy what books call to me when they call. Let's just say, it's not often I feel the need to buy a book about my craft. My list here is in alphabetical order. I have labeled my must haves and ranked each with stars (5 being the highest and 1 the lowest). Crystals for Beginners: A Guide to Collecting and Using Crystals and Stones by Corrine Kenner (****)- This short, comprehensive guide is a great introduction for any witch interested in using crystals in their magical practice. The only downside to this book is there are no pictures of the crystals in question, making it hard to identify crystals you may already have or encounter during your practice. You can read my full synopsis here. Cunningham's Encyclopedia of Magical Herbs by Scott Cunningham MUST HAVE (*****)- Every hedgewitch needs to know the magical uses of herbs. There is no better book on the market regarding the magical uses of herbs. This is a must-have in EVERY witch's library. Garden Witchery: Magic From the Ground Up by Ellen Dugan MUST HAVE (*****)- Flowers, trees, and herbs are part of every hedgewitch's repertoire, making this wonderful little book a must have. Dugan covers everything from herbal correspondences and flower language to practical growing advice and magically planning your garden. While there are undertones of Wicca, the book is not pushy with the subject. It is easy to read, delightfully engaging, and full of useful information for both beginner and advanced witches. Read my full synopsis here. Hedge Riding by Harmonia Saille (****)- This is a must have for any hedgewitch, but I did not list it has a must have because other witches and pagans won't benefit from its contents. Harmonia has done it again. This short book is a great introduction to hedge riding, how to do it, and the different realms hedgewitches travel to when hedge riding. It's easy to read and understand and great for any level hedgewitch. Read my full synopsis here. Hedge Witch: A Guide to Solitary Witchcraft by Rae Beth (***)- I was really hoping to like this book more than I did. This is NOT a guide on hedgecraft, but instead solitary Wicca. Beth gets most of the history of hedgecraft wrong and the rituals are very complicated and too formal for most hedgewitches. If you are into the Wiccan rituals and are more experienced, this is the book for you. The trance or meditation exercises are totally worth reading. They were very well explained and easy to follow. No matter where you stand on the meditation scale, these exercises are great for everyone. This is written in letter form, so be prepared to organize the book with sticky notes. You can read my full synopsis here. Hedgewitch: Spells, Crafts, and Rituals for Natural Magic by Silver RavenWolf (***)- While I know there is a lot of controversy surrounding Silver, I have always loved her writing. This book is no exception. This is a workbook. You work through several lessons over the course of days, weeks, or months depending on your choice, and slowly build your witch's cabinet while exploring some aspects of hedgecraft. This is to help experienced witches or those who are already familiar with the craft. This is not for beginners, even if she says it is. Hedge Witchcraft by Harmonia Saille MUST HAVE (*****)- While this book is a very short and basic introduction to hedgecraft, I believe every witch should read it. Why? Because it is the most accurate book on the market regarding what a hedgewitch is and what they practice (unless I decide to write my own book. Haha!) 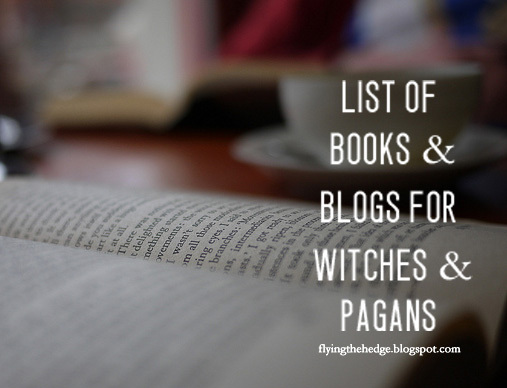 It provides a wonderful list of trees and herbs hedgewitches commonly use, a description of the sabbats according to one hedgewitch, and explains the elements. I really enjoyed this book and wish that it was longer! Read my full synopsis here. PS: You may see on the Amazon reviews that I ripped someone a new one. If you are going to review a book, at least know what you are talking about people! Magical Housekeeping: Simples Charms and Practical Tips for Creating a Harmonious Home by Tess Whitehurst (****)-Whitehurst is a master when it comes to creating a harmonious home. She mixes many ancient traditions, including Buddhism, Feng Shui, witchcraft, and more to help you make a happy, prosperous home. This is again for more experienced witches. This is not a guide on the craft but an addition to it. Practical Shamanism: A Guide for Walking in Both Worlds by Katie Weatherup (***)- I really wanted to enjoy this book more than I did. However, Part I is worth purchasing the book for. Weatherup gives complete instructions in Part I on how to journey, and her interpretation of entering the Otherworld was actually beneficial to me as a hedge rider. Parts II and III were less enjoyable and vague. This book is great for a beginner, intermediate, and advanced witches interested in shamanic journeying or hedge riding (they are both very similar). You can read my full synopsis here. Sabbats: A Witch's Approach to Living the Old Ways by Edain McCoy (****)- McCoy covers all the pagan holidays in order in this wonderful book. She covers their history and lore, rituals, spells, traditions, crafts, and recipes. This book is a stunning compilation of knowledge and a great introduction to the holidays you can celebrate to honor the god and goddess or, in my case, the earth and nature. Some of the lore may be questionable. The Complete Herbs Sourcebook by David Hoffman (****)-This is not a pagan book, although it contains strong pagan undertones, but I use it every time I write an Herbarium post. Hoffman explains the uses of herbs in medicine, even breaking down how they chemically react in the body. His entire book is easy to read and understand. He also provides information on harvesting, drying, and storing herbs, as well as the best methods of making infusions or tinctures. Hoffman's book is a wonderful addition to a witch's library, especially if you plan on using herbal remedies. The Complete Idiot's Guide to Wicca and Witchcraft Second Edition by Denise Zimmermann (****)- There is a newer edition out, but I haven't read it. This may seem like a really odd book to appear here, but Zimmermann provides a lengthy history of witchcraft and paganism, great correspondence lists, a brief overview of the sabbats and the deities, and guides to spell work and rituals. She even includes spells you can reference and change to suit your needs. The self-dedication/initiation in this book is also very beautifully written and serves as a great reference for writing your own or using if you aren't creative. This was one of the most fascinating books I ever purchased on witchcraft. It is a wonderful learning tool. The Magical Household by Scott Cunningham and David Harrington MUST HAVE(*****) - Easy to read and full of ancient folklore and tradition, this is a must-have in any hedgewitch's library. It covers everything from protection and cleansing to indoor gardens and moving. If you are not superstitious I suggest you pick a different book. Read my full synopsis here. The Modern Guide to Witchcraft by Skye Alexander (****) - I didn't label this a must have for a couple (maybe insignificant) reasons, but I strongly recommend it. Easy, fun, and accessible to read for beginners and experts alike. This is an introduction to witchcraft, not Wicca, and includes accurate correspondences, spells, and explanations on a variety of topics. Skye does a great job introducing the craft and will inspire even the oldest witches to get out there are cast a spell or two! Read my full synopsis here. The Sacred Round: A Witch's Guide to Magical Practice by Elen Hawke (***)- This book is said to be for advanced witchcraft, but there is nothing advanced about it. Instead, this book is a continuing introduction into Wicca and is full of misconceptions and false statements regarding witches in general. While the statements generally apply to Wiccans, it is important to note not all witches are Wiccans and vice-versa. However, there are some lovely sabbat rituals in the book that everyone can benefit from ready. Read my full synopsis here. The Way of the Hedgewitch by Arin Murphy-Hiscock MUST HAVE(*****) - This is a wonderful introduction, although it focuses more so on hearthcraft than hedgecraft. It outlines deities (if you are into that), home magic, rituals, and recipes all hedgewitches should know. I have mentioned this book in previous posts, including my home protection ward and threshold protection spell. As I stated, this book is more about hearthcraft than hedgecraft, but it a must have in any hedgewitch's library. The Witch in Every Woman by Laurie Cabot (***)- This is a very empowering book for women, especially those who are unsure of themselves. Cabot empowers women to reawaken their "magical nature through the feminine to heal, protect, create, and empower" by presenting a series of Celtic goddess short stories and lessons accompanied by her own thoughts and feelings. While slightly hetero-normative and dated, the book is a worthwhile read, but not a must-have for all witches. Need some empowerment? Unsure of yourself as a woman witch? Then this is the book for you. Read my full review here. To Ride a Silver Broomstick by Silver Ravenwolf (**)- Like Teen Witch, some of the history, lore, and techniques are questionable. This book has worked for many and while I think that's great, I would be careful if you are interested in this book. I gave my copy to Goodwill. However, it is a series of lessons designed to help you work through the craft. Silver has a way with words so the book is enjoyable and easy to read. I do not suggest this book. Teen Witch by Silver Ravenwolf (*)- This was one of the first books I turned to when I wanted to learn about Wicca and witchcraft. I do not recommend this book. While Silver means well, the book attacks Christians yet makes Wicca out to be like Christianity. Much of the history and techniques are questionable as well. Wicca: A Guide for the Solitary Practitioner by Scott Cunningham (****)- I don't practice Wicca anymore, but if you are interested, again Cunningham takes the cake. This is a great introduction to Wicca, but also a great introduction to how to set up a ritual, how to perform spell work, and how to track your growth through the use of a Book of Shadows. Even if you aren't interested in the religious part of it, I still suggest reading this book for his expert knowledge on witchcraft. Witches, Midwives, and Nurses: A History of Women Healers by Barbara Ehrenreich and Deidre English MUST HAVE (*****)- Okay, so this isn't strictly about witchcraft. Instead, it is a feminist piece from the 70s, but it is wonderful all the same. Despite some slight inaccuracies, this book gives a compelling rendition of women as healers through the ages. Witches, especially hedgewitches, were and are traditionally healers, making this book an excellent addition to any pagan library. When I finished, I felt compelled to buff up on herbal remedies and add some new information to my ever-growing library of healing. This book also put many historical events into perspective for me, giving me a much better understanding of where we began and how much things have changed over the centuries. Read my full synopsis here. Your Book of Shadows: How to Write Your Own Magickal Spells by Patricia Telesco (***)- I both loved and hated this book. The first chapter or two are definitely the best parts and worth reading if you get your hand on a copy. They provide wonderful insights into creating your own BOS/grimoire and provided me with some fresh ideas to get started. The rest of the book, while useful, is a basic introduction to Wicca. If you are new to the craft, this book would be a MUST HAVE. If you are an experienced witch, such as myself, only the first chapter would be particularly useful. Read my full synopsis here. There are also some online sources I would suggest apart from my own blog of course. Penniless Pagan is another great blog for witches and pagans alike, whether you are starting out or advanced. It is especially useful if you are short on cash or don't believe your practice should cost money. Michaela is a wonderfully hilarious blogger who knows her craft well. If you are more into cottage witchery, T.C. from The Witch of Lupine Hollow is the blogger for you. 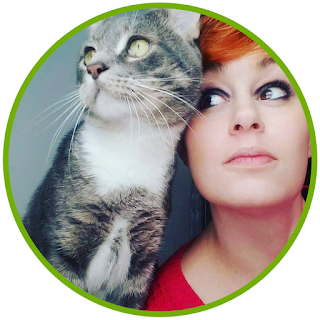 She is a wonderful writer, blogs often, and is a huge supporter of other bloggers. Mark over at Atheopaganism is for those who, like me, don't believe in deities. He updates often and there is a great discussion taking place every day on the Facebook page. You can't go wrong with Llewellyn Worldwide. They sell a variety of pagan, Wicca, and witchcraft tools and books. They also have wonderful articles that I have referenced before. About.com's Pagan and Wicca section is very well put together and very accurate. A great resource for history, lore, and correspondences. Patheos Pagan, like Pagan Bloggers, is a blog database with content from a variety of pagans around the world. With knowledge and practice come wisdom. If you are new or even experienced, learning more about your craft is the best thing you can do. Remember, your mind is a garden. Nurture it. I will be updating this list as I find more books I think you should read and blogs I find useful.